Multiply the grams of total fat by nine because there are nine calories in one gram of fat. For example if the label says the food has five grams of total fat, five times nine equals 45. Locate the number of servings if analyzing a packaged food. For example, at the top of the label it will say what a serving is; this could be in ounces, cups or tablespoons. Then in parentheses it often says how many servings the whole package contains. 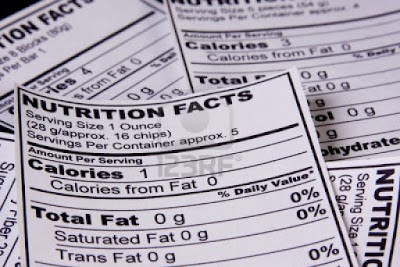 Multiply the calories from fat by the number of servings in the package to get the total calories from fat. Be careful to use the number of total fat grams and not just saturated fat. Total fat is the amount of fat listed first on the label.